Tagines (or tajines) in Moroccan cuisine are slow-cooked stews braised at low temperatures, resulting in tender meat with aromatic vegetables and sauce. 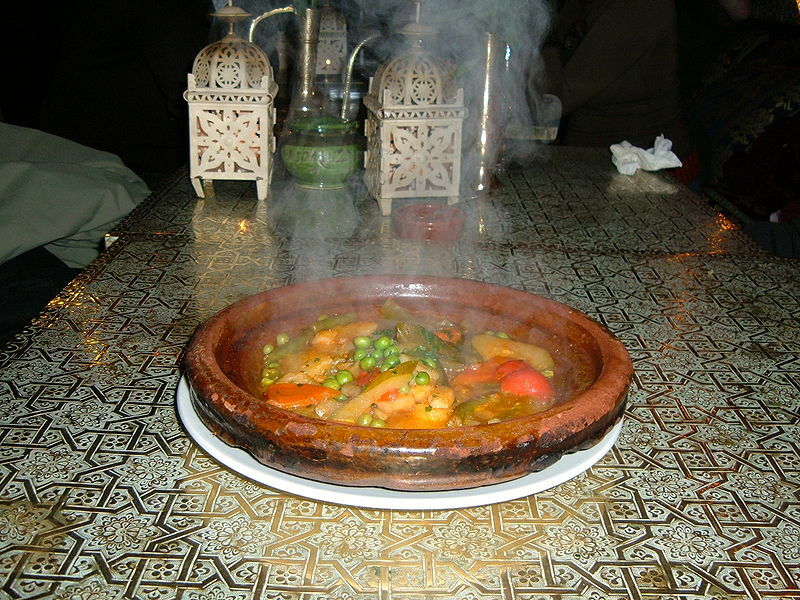 Left: A tajine dish as served in Marrakesh. They are traditionally cooked in the tagine pot, whose cover has a knob-like handle at its top to facilitate removal. While simmering, the cover can be lifted off without the aid of a mitten, enabling the cook to inspect the main ingredients, add vegetables, mix the contents, or add additional braising liquid. Most tagines involve slow simmering of less-expensive meats. For example, the ideal cuts of lamb are the neck, shoulder or shank cooked until it is falling off the bone. Very few Moroccan tagines require initial browning; if there is to be browning it is invariably done after the lamb has been simmered and the flesh has become butter-tender and very moist. In order to accomplish this, the cooking liquid must contain some fat, which may be skimmed off later. Moroccan tagines often combine lamb or chicken with a medley of ingredients or seasonings: olives, quinces, apples, pears, apricots, raisins, prunes, dates, nuts, with fresh or preserved lemons, with or without honey, with or without a complexity of spices. Traditional spices that are used to flavour tajines include ground cinnamon, saffron, ginger, turmeric, cumin, paprika, pepper, as well as the famous spice blend Ras el hanout. 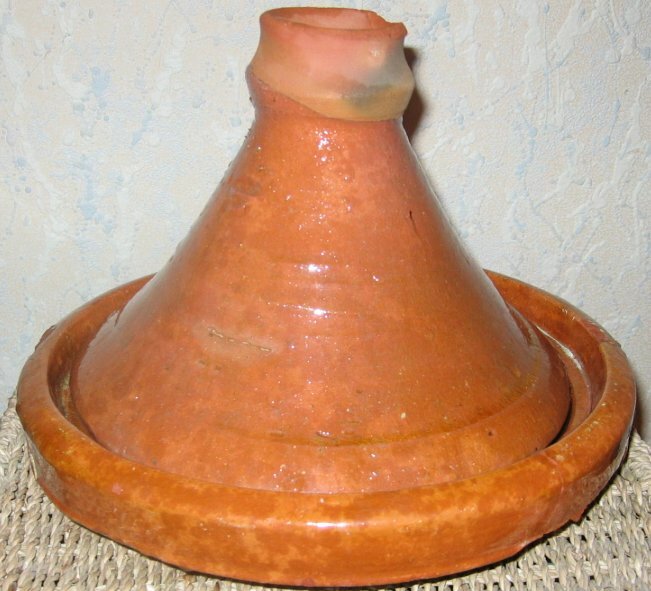 Other ingredients for a tajine may include any product that braises well: fish, quail, pigeon, beef, root vegetables, legumes, even amber and agarwood. Modern recipes in the West include pot roasts, ossobuco, lamb shanks and turkey legs. Seasonings can be traditional Moroccan spices, French, Italian or suited to the dish. 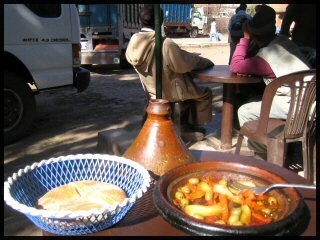 Left: A vegetable tajine dish. Some famous tajine dishes are kefta (meatballs in an egg and tomato sauce), and mrouzia (lamb, raisins and almonds).